Cane toad in the Grant Museum. 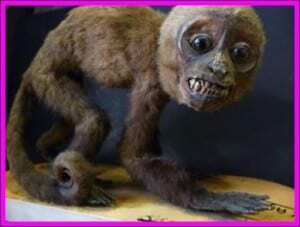 Note the giant poison glands behind the eyes. 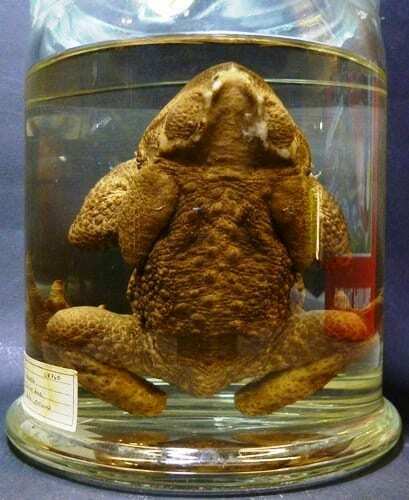 1) Cane toads – Rhinella marina (the commonly used Bufo marinus is not currently valid as a name) – are a large species of amphibian native to Central and South America from Texas south to the Amazon and Peru. What they are famous for, however, is being one of the world’s “worst” invasive species. They are major pests in Australia, the Philippines, the Caribbean and Hawaii. 2) 101 Cane toads were deliberately introduced into Australia (from a feral population in Hawaii) in 1935 by The Australian Bureau of Sugar Experimental Stations. Few more significant ecological mistakes have been documented in human history. The reason for the introduction was to control “cane grubs” – beetle larvae which were damaging Queensland’s sugar cane crops. This is pretty incredible as the grubs live on the root stock (underground) and the adult beetles live in the cane plants – (up off the ground). Whilst the toads are voracious predators, they hunt ON THE GROUND – not under it or above it, so there was no chance this experiment was going to work. Indeed it didn’t – cane toads had no effect on controlling cane grubs. They really should have a different name. 3) What they did succeed in doing is eating genuinely everything smaller than them – invertebrates, native frogs, lizards, small mammals, birds… EVERYTHING. 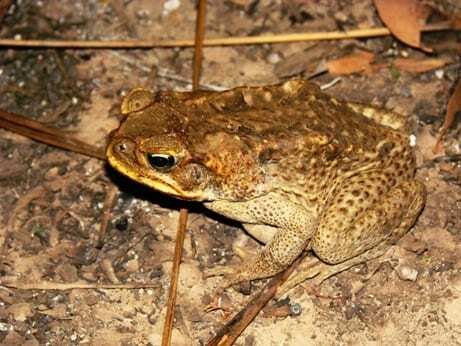 Cane toads can reach 30cm in length, so most things in Australia are much smaller than them. Absolute chubbers can reach 1kg in weight, and if that weren’t awful enough I’ve heard “reports” of toads getting up to 3.4kg. Human babies start smaller than that. Cane toad in Kakadu National Park. 4) As well as decimating the small animals, they also wiped out many of the big ones. The giant lumps behind the toads eyes are massive poison glands (parotid glands). When distressed (or eaten, for example), the glands ooze a sticky milky bufo-toxin which is more than capable of killing everything dog-sized or smaller, so that’s all of Australia’s predators – dingos, quolls and other dasyurids, crocodiles, freshwater turtles, big fish, raptors, owls, monitor lizards and snakes. 5) Since their arrival in Gordonvale near Cairns (far northeast), toads have rapidly spread south and west, and are now well into Western Australia and New South Wales. Recent research has found that toads on “the invasion front” have evolved stronger and longer limbs, allowing them to disperse further and quicker. I’ve done fieldwork in the Top End of the Northern Territory (described here) where essentially all of the mammals had disappeared, but we were seeing hundreds of toads each night. I’ve also done a lot of fieldwork in the Kimberley in Australia’s far northwest before the toads arrive. We expect them there in the next couple of years and that is truly terrifying as it is currently extremely rich in small mammals, frogs, snakes and lizards, which will not survive. Despite huge amounts of research, no solutions have been found to make a dent in the impact of these giant lumps of destruction. 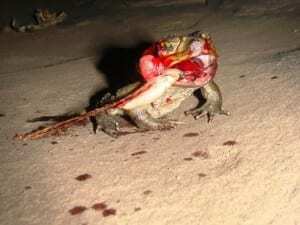 Dead cane toad with tongue stick to rock. 6) Exta point. I found a toad once which was dead, but had its bloodied tongue stuck to the sandstone it was sat on. It’s hard to imagine how this happened – suggestions or similar reports welcome. It appears that the sticky pad at the end of the toad’s tongue became permanently adhered to the rock. The damage around its mouth suggests it died trying to pull its tongue off of the rock. I may despise toads and wish they all suddenly died, but I would never want for an animal to suffer. I don’t share this for anyone’s amusement. *This is a strong word, but I stand by it. You would be right to say it’s not the toads’ fault. I know this and hold people entirely to blame for the damage toads do. That doesn’t stop me getting irked when I see them in a habitat that they are destroying though. I have read that cane toads can protrude their stomachs through their mouths in the event of physical stress or eating something disagreeable, but can’t always successfully retract them again, although I’m having trouble finding a verifiable source on this. Saw an absolutely massive one (dinner plate sized) in a quarry in Brazil. Apparently they can give you a nasty bite!